WIN! Ciate Mini Mani Month Beauty Advent Calendar - Open Worldwide! 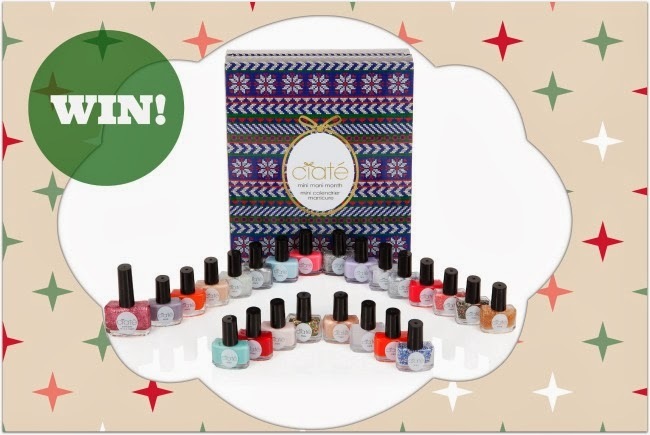 When it comes to beauty advent calendars, the Ciate Mini Mani Month is the cream of the crop. Behind each door lies a talon-tastic treat - the cheery packaging, inspired by Christmas jumpers, contains nineteen mini Paint Pot shades, bestsellers all, along with two caviar Pearls, two sequin/glitter polishes and a full-sized Paint Pot. A dispenser for the Caviar balls is included and the whole thing is just a joy to behold. Worth €55, you'll find it at Mink Hand and Foot Spas in Ballsbridge and Donnybrook, and online at the revamped www.mink.ie. Or keep reading, because thanks to Mink, Christmas will be coming early to one of you lovely lot - I have one to give away, and it's open worldwide! Chocolate? Pfft - who needs it? Get entering via the widget below. I've got one of these selling in my shop - aren't they fab! I've always wanted to try their polishes! Thanks for the chance! FABULOUS GIFT - I NEED THIS!! That is the most amazing advent calendar ever!!! Beats chocolate hands (nails :P) down!! And i thought the best advent calendar had choccie inside.. what a great prize! Ohhh this is the perfect advent calendar for me ... well, actually chocolate always comes first, but then it's nail polish!! This advent calendar is epic! what an absolutely fab prize. Amazing gift! Good luck to everybody! Awh Such a cute box! What a brilliant advent calendar! I'm clearing a spot in my beauty larder for these.... ooh so excited!! fingers crossed. Amazing giveaway, I love Ciate! Great Giveaway! I've never tried Ciate before! Fabulous, would love to win. I would sooo love this!!! WANT. This is so cute! I love ciate, I bought my daughter some last christmas and it's fabulous. What an amazing giving away. I would be in heaven if I won this. what a fantastic giveaway - thank you! would love to win this oh so much! Ah how nice of you!! I saw this last year and wanted to pick one up, but couldn't stretch the budget! Love the giveaway! Thanks for the chance! I'm dying for this but haven't been able to justify it! I would really, really LOVE to win!!! I walked away from this in sephora in Toronto last month..... Big mistake! Count me in please - great giveaway! Gorgeous! So much better than chocolate, and that's saying something! Great giveaway Emma! Entered. Ciate has awesome nail lacquer. I like that they did an advent calendar. Such a cool idea! Who wouldn't love this!! Feeling very lucky after my recent win... this would be amazing! I saw this being spoken about on a lot of beauty blogs last year, it's been on my wishlist ever since! Unfortunately, as a student it will probably stay there! Great prize Emma, this looks amazing! A really awesome prize! Nail polish would be sorted for 2014! I'll have that, thank you very much. SO PRETTY! would love this! oh yes please from me and my 2 daughters!! Amazing giveaway :) Thanks allot ! I need this in my life...I find anytime I buy new makeup the excitement wears off far too quickly, so to have a new window to open each day would be heaven! Ive been wanting one of these since they came out!! Fingers crossed would really make my day if I won this!!! Fingers crossed it's not too late to win this! Love to get this <3 looks great! Sickened I didn't pick up an advent calendar this year. This looks fab!